Do you want to put forth the best bartender resume in Maryland? The only way to get the ideal bartending job, with the best bartender wages in Maryland, is by having a certificate from a reputable bartending school. Not only does Maryland Bartending Academy give you the qualifications to achieve the right job, but personal assistance and an excellent job placement program. If you are ready for expert bartender training or bartending job assistance simply call 410.787.0020or click here! What goes into the best bartender resume in Maryland? There are some simple steps you can take to make sure you stand out when it comes to what employers are looking for in a bartender. Qualifications: What experience and knowledge do you possess? 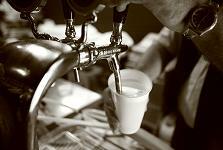 Bartending requirements for employment go beyond the most basic pouring skills. If you have special talents that set you apart from the crowd, then you can be all but guaranteed the best salary and the best hours at the best bars. Whether it be the trick bartending or just a vast knowledge of lesser known and classic drinks, your certificate from Maryland Bartending Academy will prove to your employers you know more than the average bartender. Education: Where did you receive your bartending training? Whether you went through a short course at a school for your bartender license, or spent years working your way up the restaurant ranks, your potential employers will want to know what you know, and how you learned your skills. Unfortunately, if you were merely trained on the job at a particular establishment, you won't have the full range of skills offered by a bartending college, which apply to every bar and pub. Work Experience: This is especially pertinent if you have not completed a training program. However, with a certificate of completion from a professional bartending school like Maryland Bartending Academy, you will not have to worry about an experience issue since local employers are familiar with the institution and what we can offer them in terms of expert mixologists, regardless of how long it took our students tocomplete the coursework. If you're ready to enter the job marketplace with your skillset, your professional bartender resume in Maryland, and your expert training, then our job assistance program is the final step in the process. We will assist you with our network of contacts in and around the bar industry. We have gotten our graduates bartending careers at establishments ranging from the highest class hotel bars and lounges, to local area pubs. It all depends on the atmosphere, the aspirations, and the talents of the individuals. Many students have stated that our job assistance training alone is worth the cost of bartending school.